Soak the green peas in water overnight. Cook it in a pressure cooker with enough water and salt. Heat oil in a pan and splutter mustard seeds and add curry leaves. Add chopped onions and saute till transparent. Add green chillies ,ginger and garlic paste and saute well. Add chopped tomatoes and cook till soft. Then add chilli powder, coriander powder, turmeric powder and garam masala and saute well for 1-2 minutes on low flame. 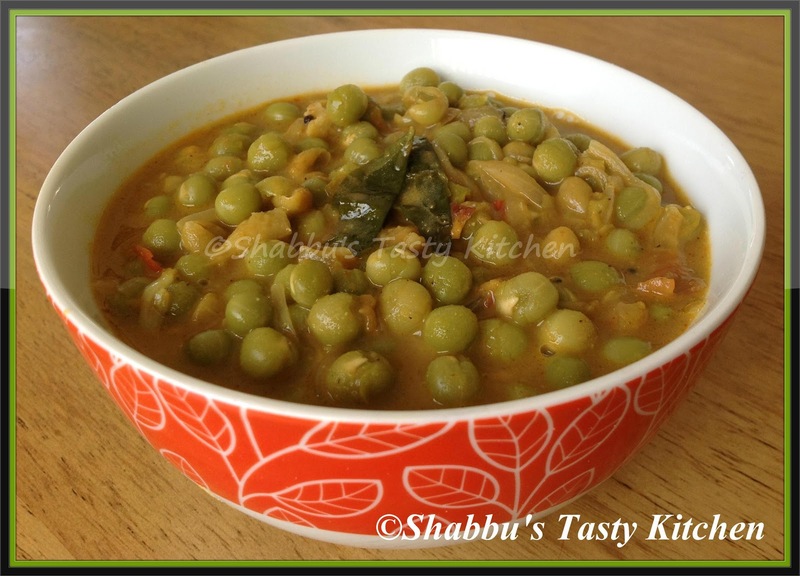 Add cooked green peas along with its water (about 1/2- 3/4 cup) , mix well and boil for few minutes. Finally add the thick coconut milk and cook for 2-3 minutes. Check the salt..Serve hot with chapati,puttu, appam etc..
very delicious preparation.. perfect with parotta.. Excellent side dish for chappathis,ghee rice..One of my fav masala. Could anyone pass me some plain rice to go with this green peas masala please???? Full of flavor with the coconut milk..